I’ve noticed lately that things that are totally on trend right now were actually cool back in the 90s. Since I was born in 1990, I was too young to really be into fashion in the 90s. 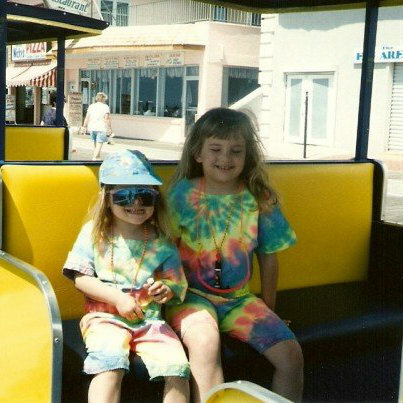 My mom dressed me, and as you can tell from my matching tie-dye outfit and “stunna shades,” I was pretty fashionable anyway … not. Having missed out on any real 90s fashion, I’m so excited about this trend. From crop tops to high waists to flannel, it’s all coming back. I’d love to make a joke that ties in “Backstreet’s Back” but I can’t think of anything – just know that I tried. So although I was only a wee tot when 90s fashion was in full swing, I totally consider myself a 90s girl, from my taste in music (*NSYNC all the way!) to my obsession with this trend. Miley Cyrus is big on the 90s trend. Since she’s younger than me, I know she wasn’t originally a part of these trends when they were first popular, but maybe that’s why we’re drawn to them. I’m a child of the 90s, and when I was growing up, I looked up to people on Dawson’s Creek and 7th Heaven. They were the “cool kids” that I aspired to be. Maybe now that my generation is at the age those people were at when we were little, we’re just proclaiming that these things are cool again. Maybe it’s fashion, maybe it’s FOMO (fear of missing out), or maybe it’s just a bit of nostalgia, but whatever it is, I’m happy about it. My first crop top memory was Britney Spears in her “Baby, One More Time” video. What ten-year-old little girl didn’t want to grow up to be just like her? She was beautiful, sang like an angel, and all the boys loved her. And she rocked a crop top like nobody’s business, but of course, I was too young to show that much skin. High waisted skirts and pants pair perfectly with crop tops. If you’re not into showing as much skin as a crop top allows, pair it with a cute high waisted skirt. You can really get into the 90s trend with some flowy high waisted shorts. I guess the saying that what’s old is new again is pretty accurate! What do you think about bringing the 90s trends back? Love your story. Tie-dye is back in full swing, too.